My friend and fellow advocate Libby Thaw said the above words several years ago. Today, her quote is still one of my all-time favorites because it speaks to the heart of our humanity—judgment. Libby, founder of the Checkered Eye Project works tirelessly to expand awareness of low vision. As people we are not immune to making assumptions or mistakes, it’s part of our DNA as humans. Through careful, honest, and frequent self-assessment we can become better people. When we take the time to learn other people’s stories, this is the first step to increasing our understanding. Libby is sitting at her sewing machine working with a black & white checkered patterned material. She is wearing a black top and tortoise-framed eyeglasses while her fingers guide the material under the needle. A small portion of her short-cropped salt & pepper sassy hairstyle is seen. My beautiful friend and dedicated advocate, Libby Thaw, has taken her awareness effort to yet another level with a tattoo. Demystifying and embracing our disabilities drives out feelings of shame and we emerge victoriously! Image: A close-up photo of Libby waving to the camera with her right hand and wearing a black sleeveless top to display her newest tattoo. Her eye chart tattoo is on her left shoulder. The letters of the eye chart spell out S.T.A.R.G.A.R.D.T.S.E.Y.E.S. I could go on and on about my friend Libby Thaw, a gifted singer, performer and all around awesome person but I’ll let the song and the article do the talking. Libby Thaw, founder of The Checkered Eye Project has been raising awareness about the wearable symbol for 17 years and her latest inspiration came by way of a song with the hopes of further boosting understanding. My friend and fellow “Woman on the Move,” Libby Thaw of The Checkered Eye Project, began a Facebook campaign earlier this year to increase awareness on low vision. 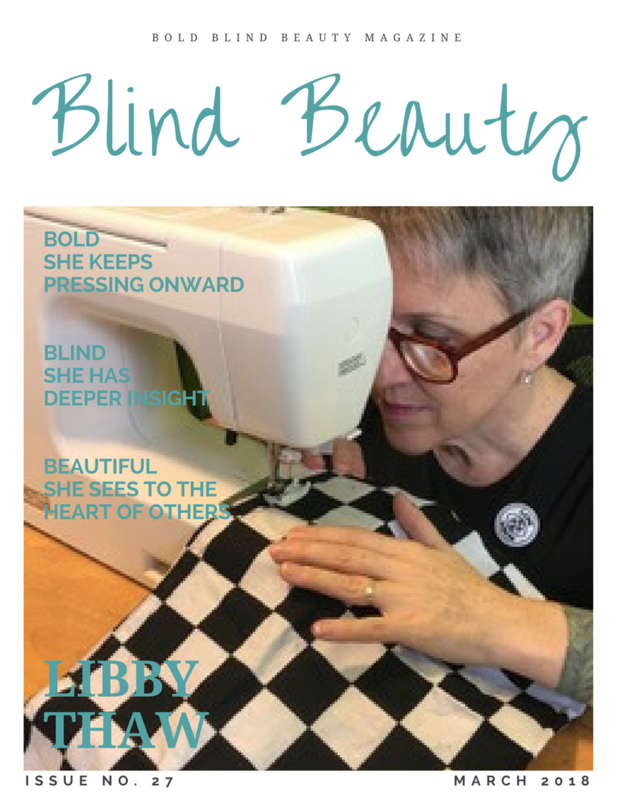 I’ve featured Libby several times on Bold Blind Beauty and today I thought I’d share the ‘Tellafriend Tuesday,’ campaign here. One of the joys I receive from this blog is the sense of community among our members. In addition to sharing style tips with women who are blind or sight impaired, I wanted to create a space where we can talk openly about blindness/sight loss to bring together sighted and non-sighted communities to share our experiences and learn from one another. On a number of occasions we’ve talked about the vast range of sight loss, how blind people appear, and the dichotomy of living in the sighted and non-sighted world. For many people with low vision one of our major pain points is not being fully sighted yet not being fully blind. Case in point, check out the photos in this post of a few of my lovely friends who, if you were not aware, have sight loss. Adapting to losing a major sense like eyesight is extremely difficult physically and compounded emotionally by the frustration of a hidden disability that others do not, or cannot understand. Think of it this way: if someone who appears healthy is diagnosed with cancer no one would say to that person “you don’t look like you have cancer.” The same holds true for people with low vision who may or may not require mobility aids. Looking or not looking blind does not alter the fact that a person with significant sight loss may function well due to adaptability to their environment. What this means in part is once we’ve gotten the lay of the land we may not need to rely on our mobility devices if we use such devices to navigate. However if an unannounced change should occur within that environment it could cause a serious mishap. Libby created the Checkered Eye to aid people with sight loss self identify their disability in face-to-face interactions and to help sighted people recognize that when a person is wearing the symbol it means that individual has sight loss. The black and white checkered eye—an image of a simple eye the center of which, the iris, is black and white checkers bears the text “LOW VISION”—is a wearable symbol to indicate its user has a sight impairment. Since Tellafriend Tuesday is movement to increase understanding on sight loss Libby is asking us to share the message on social media. You can help Libby tell the whole world there’s a “blindness spectrum” by sharing this blog post or downloading and sharing the “Blindness Symbols” image in this post. Not everyone who looks sighted is fully sighted. Not everyone with a guide dog or white cane is fully blind. A bit of understanding can go a long way in the lives of people who are already managing some real difficulties. Please share on your Facebook timeline, Twitter and/or Instagram and see if you can get a friend to share too! THANKS!